Today we’re excited to announce the release of ImagePlot 1.1 - a free software tool that visualizes collections of images and video. This updated version was developed by Jay Chow and Matias Giachino. The development was supported by Mellon Foundation grant "Tools for the Analysis and Visualization of Large Image and Video Collections for the Humanities." Comparing 90,000 images from Digital Art category on deviantArt (left) and 90,000 images from Traditional Art category (right). In each image plot, images are sorted by average brightness (x) and average saturation (y). 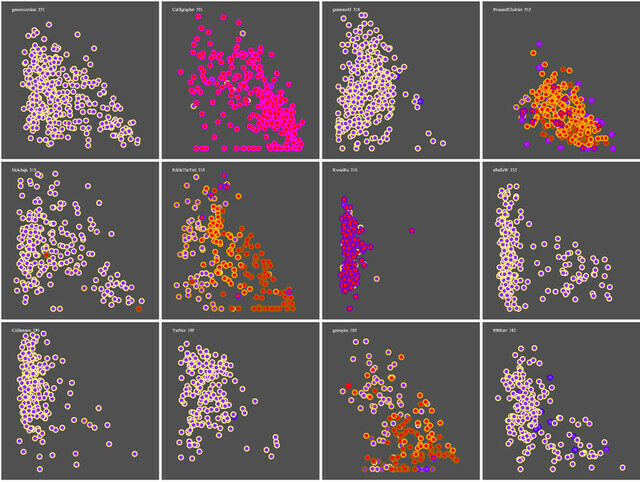 Software which analyzes these and other image properties is included with ImagePlot. ImagePlot code can be easily extended and customized. This visualization compares image galleries from a number of deviantArt users. The colors of the circles indicate the primary and secondary categories of each image (e.g., Traditional Art / Portraits). The individual plots are combined into a matrix using ImageJ built-in command. ImagePlot can create animated visualizations. Here we animated 128 paintings by Piet Mondrian from 1904-1917 over time. The year is indicated in the upper left corner. The distances between paintings indicate their visual similarity.